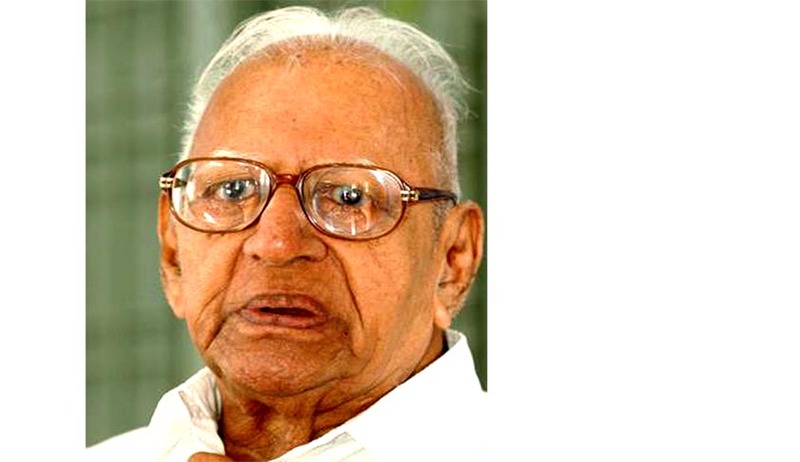 Justice V.R.Krishna Iyer who is considered as the “judicial conscience of India” turned 99 this month. Justice Iyer has the rare distinction of being first a Minister in State a Cabinet and later a Judge of the High Court and Supreme Court. He was the Law Minister of Kerala in the first democratically elected Communist Government led by E M Sankaran Namboodiripadu. The government was later dismissed by Nehru Government by misusing Article 356 for the first time in Indian Constitutional history. In 1968 he was appointed as a Judge in the High Court of Kerala and in 1971 he become a member of Law Commission of India. His appointment to Supreme Court in 1973 was protested by leading members of the bar including Soli Sorabji because of his affiliation to the leftists. As part of the Birth day celebrations scheduled to be held on Saturday, the 16th November, 2013( 04:00 P.M. at The Gateway Hotel Marine Drive,Cochin) the Chief Justice of Allahabad High Court Dr.Justice Dhananjaya Y. Chandrachud will be delivering the fifth Justice Krishna Iyer Lecture. To commemorate the occasion, a book on Justice Iyer " A Surfeit of Tributes to India's Greatest Living Judge" will be released by Law Minister of India Mr. Kapil Sibel. Interview with George Gadbois by Livelaw is also included in the book. In the interview Mr.Gadbois responding to the question "who was best Judge india has ever seen?" said "For the 1980s, the choice is between Justices P N Bhagwati and V R Krishna Iyer. It’s my view that Justice Krishna Iyer was the best of the two. Impeccably honest, a game changer in that he, more than Justice Bhagwati, spoke effectively for the poor. Though Justice Bhagwati fans may disagree, Krishna Iyer was, I believe, the founder of Public Interest Litigation and the liberal expansion of locus standi". Justice Iyer opened the windows of the Supreme court to the People of India which includes butcher, the baker and the candle - stick maker , the bonded labour and pavement dweller by relaxing the rule of locus standi. It was his judgment regarding Indira Gandhi's election case led to the declaration of Emergency in 1975. He is known as the father of prison jurisprudence in India. Justice Iyer retired on 15th October 1980 from the Supreme Court. Many do not know that Justice Iyer started his career as a Journalist in an English Magazine. “I did not want to become a journalist but desired to be an Advocate since my father was a successful lawyer and that influenced me to choose my career as a lawyer. My father was President of the Taluk Board, Calicut and Kurumbranad. He started many schools and a few hospitals as President of the Taluk Board. I began as junior of my father. Somehow I had a Leftist leaning and the poor people at the working class liked me and my views. The Communist Party liked me and I had appeared in number of cases in the early days for the poor and the workers and peasants. Thus, I became a popular advocate. My income was not large but as an advocate I rose higher as a leader of the Bar. In a few years time, I appeared in several courts, civil and criminal. Curiously, I was wanted in many places as a successful advocate and in a few cases even against my father. From Quilandy my father shifted to Tellicherry District Court Bar. In a few years time the District judge recommended me to the Government of Madras to be appointed as Public Prosecutor and Government Pleader. In the Annamalai University we had a debating society and I acquired a reputation as a fine speaker in debates. The foundation laid for becoming a successful debater became an asset for me. As a good writer in English my papers earned good marks for me. Once in the class the English Professor read a paper and said this was the best paper in the whole class. It turned out to be mine. My English Professor was a White man with a doctorate from the London University. He very much appreciated my language and this was an inspiration for me. Later in the Madras Law College I earned a good rank in the FL and the BL. The two years in the Madras Law College made me a good student of law and when I set up practice in Quilandy and Tellicherry I could easily become a sound advocate and a leader of the Malabar Bar appearing in Calicut and Palghat at a young age. I was successful and when the first General Elections came, popular public opinion made me a Leftist candidate defeating my rival Congress candidate. As an MLA, EMS had the largest support and was going to be the Chief Minister and he requested me to be a Minister in his Government. Under his pressure, I agreed. I was offered Law, Home, Prison, Inland Navigation, Irrigation, Electricity and Social Welfare. I made success of each of these portfolios brought in radical reform in prisons, irrigation and electricity. Entry into politics made me a well-known political figure earlier in Madras and later in Kerala legislatures. As an Opposition Speaker, Rajaji as Chief Minister in Madras, and Pattam Thanu Pillai as Chief Minister of Kerala were appreciative of my creative performance. In Kerala I was an independent throughout and could meet J.Nehru frequently. In Kerala, the Communist Party became so strong that the Congress lost hope and coming to power through election. This made them start a liberation struggle for which they resorted to even quasi-violent methods. I had to use all my imaginative resources to meet the Congress who tried to gain power resorting to contra-constitutional methods. I requested J.Nehru to come and see for himself how his party was behaving and how I could manage to defeat their strategies. Nehru came and so and could not find a solution for the political chaos and ultimately persuaded the Central Government to dismiss EMS Government and order a fresh election. Meanwhile I had large practice at the Bar and the Chief Justice M.S. Menon persuaded me to become a Judge in the Kerala High Court. Dange, the great Communist Leader inaugurated my election campaign. Mohan Kumaramangalam, a Leftist friend of Indira Gandhi was ideologically close to me. He was keen that I should go to the Supreme Court. He succeeded and I became a judge of the Supreme Court in 1973 although Mohan Kumaramangalam himself died in an Air Crash and did not have the good fortune to see me sit on the High Bench. In 1980 I retired from the Supreme Court. In my judicial role I found my experience as a minister of many portfolios useful and made my judgments a different class from other judges. In a sense I transformed the court from a conservative institution into a radical instrument of democratic dynamism. The highest court became the watchdog of the Executive and the Legislature of the Nation. The fundamental rights which empowered the citizens found implementation through Public Interest Litigation by the radicalization by a group of judges. Among this group were Justice Chinnappa Reddy, Justice Bhagwati, Justice Desai and myself. We made the court a power which made the left value of the Constitution a reality. Whether it is an exaggeration I cannot say but there is an impression that among great judges could be included as one with Earl Warren of the USA, Lord Denning of Britain and myself from India as three great judges of the modern world. Please exclude me from the three. Whether there is even an iota of truth in it in this flattering statement, my progressive performance can be judged from the judgments of mine which have been published in a book by Oxford University Press named ‘Speaking for the Bench’ and over 100 books I have written.